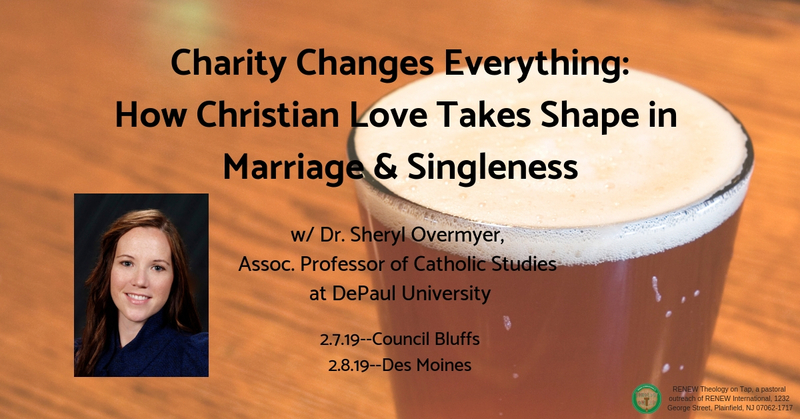 Our Spring Series of Theology on Tap begins with a collaboration with the Diocesan Department of Marriage and Family Life to bring to town Dr. Sheryl Overmyer, Associate Professor of Catholic Studies at DePaul University. Dr. Overmyer will speak on what Christian love looks like in various walks of life, with an emphasis on what living the virtue of charity really looks like. Off-site childcare is available for this event through the Department of Marriage and Family Life--contact Adam Storey at 515-237-5056 for details. Des Moines event: food may be brought from the outside, but please don't bring outside drinks. Instead, please patronize the bar at the Event Center. Council Bluffs event: food and drink are both available for purchase on site, please do not bring outside food or drink in. Chances are someone you know is struggling with or has struggled with the cross of infertility, secondary infertility, miscarriage, or infant loss. In a culture that misunderstands the true value of life, this cross can be isolating and confusing. What are the best medical options for these couples, and what does the Catholic Church actually teach about these heartbreaking topics? What concrete ways can you help support your brothers and sisters who are struggling with this cross? 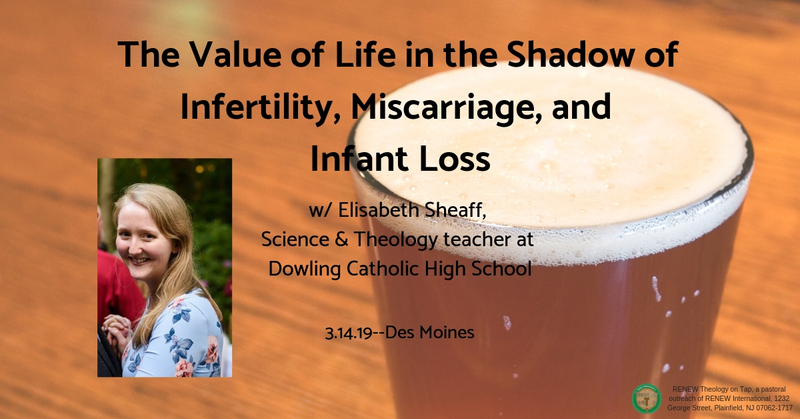 Elisabeth Sheaff is a Science and Theology teacher at Dowling Catholic High School. She earned a degree in Biological Science from the University of Notre Dame and a Masters in Education from National Lewis University. She is passionate about the Catholic faith, science, and the intersection of the two. She currently lives in West Des Moines with her husband, Spencer. All are invited to bring food if they'd like, but please do not bring outside drinks--instead, patronize our generous host, the Sherwood Forest Event Center, for all your drinks this evening. 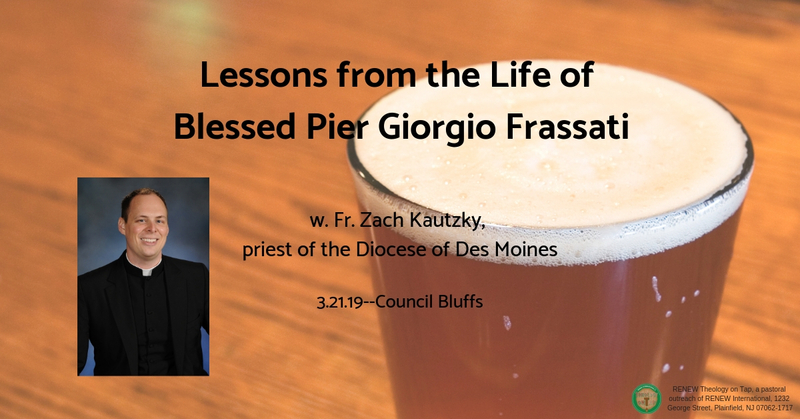 Join us in March to hear about the life of Blessed Pier Giorgio Frassati from Fr. Zach Kautzky of Corpus Christi parish. Food and drink are both available for purchase on site, please do not bring outside food or drink in. Faith and Science are often seen as fields eternally at odds with one another. This unfortunate perception is based on a number of errors from both sides, and Dr. Kuebler will help us navigate this minefield to realize the beautiful harmony faith and science truly enjoy. 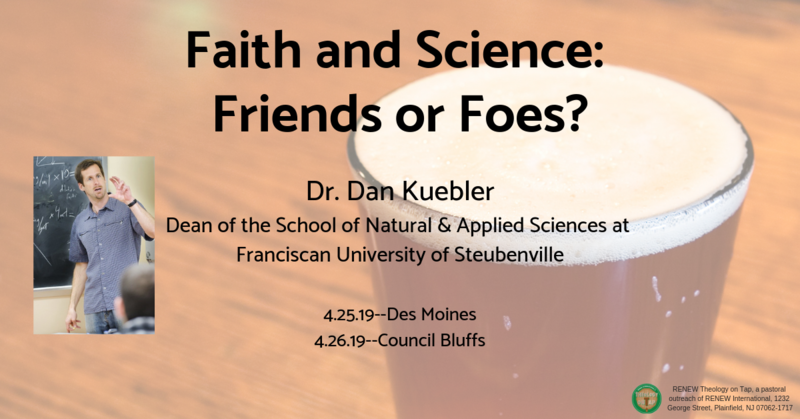 Dr. Kuebler currently serves as the Dean of the School of Natural and Applied Sciences and the co-Director of the Franciscan Institute of Science and Health. He has served on the faculty at Franciscan University of Steubenville since 2001 and currently teaches courses in evolutionary biology, cell biology, and human physiology. His biological research involves two major projects, 1) examining the quality and effectiveness of various biologics (bone marrow, platelet rich plasma, placental tissue) to treat orthopedic disorders and 2) understanding the relationship between metabolism and seizure disorders. In addition to his lab research, he is the co-author of The Evolution Controversy: A Survey of Competing Theories, a book that critically examines the various theories of evolutionary thought. He has also published a variety of popular articles on science, politics, culture and religion and gives seminars on the relationship between science the Catholic Church as well as evolution and the Catholic understanding of Creation. He received a Ph.D. in Molecular and Cell Biology from the University of California, Berkeley and earned a Masters of Science in Cell and Molecular Biology from the Catholic University of America. He also holds a Bachelors degree in English from the Catholic University of America.